Ok, I lied. I said I was going to take a break from blogging for a little bit (& if I was smart, I wouldn't be using packing time to blog), but I'm afraid if I wait I will forget all the wonderful things I learned last weekend at the Haven DIY/Home Blogger Conference. Let's start out with this: I am not a risk taker. At all. My husband likes to tease me & say that we met during my 6 weeks of rebellion in college. I like tradition, stability, routine. Ironic for a military wife, huh? The positive side of this is that I tend to be fairly organized & I invest a lot of time before I start any type of work project. The negative is that I don't like taking chances & if I don't feel properly prepared for something or assured of success, I'd prefer to just not do it at all. But, as I've said before, my mom's example of a well-lived life encouraged me to take the risk of starting my own business & blog, even though I have no way of knowing the outcome. But thank goodness I finally took a chance, because it has led to some great (& some surreal) moments, including the conference. I read a lot of blogs, at least 25-30, maybe even more. I don't read each one every day, or even every week, but I like to check in fairly often to see what's going on in the DIY/Home blog world. Blogs provide me with a ton of education & inspiration, more so than any of my design classes, maybe because they are written by real women (& men) who have decided to take their passion & just go for it. They write about both the successes & the setbacks, and I try to learn as much as I can from them. 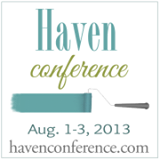 So when I saw a chance to attend the Haven conference, I just had to go for it. 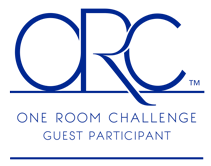 I was nervous to attend because I am such a new blogger, & because I didn't think I would know anyone else going, but I knew I would kick myself if I didn't attend. And I am so glad I did!! 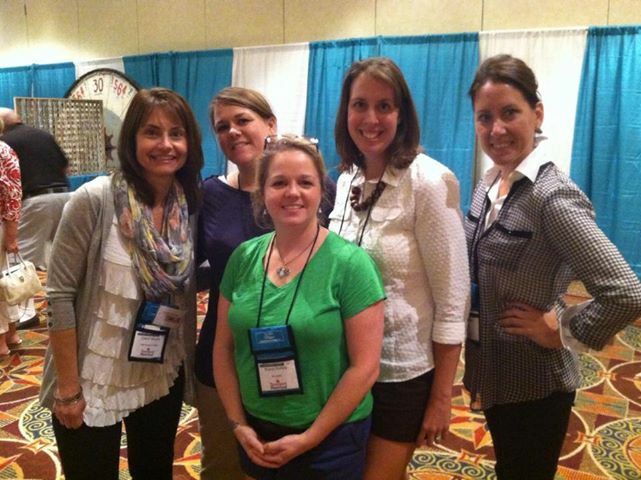 I met so many wonderful people, including this great group of bloggers & artists below. I was super nervous (as I usually am in social situations), & was grateful to meet these sweet ladies the first night. Our time together was filled with laughter. Thanks for making my first conference a great experience! In addition to meeting some of my favorite bloggers, I learned SO much. Most of it was helpful, but some of it gave me anxiety because I learned all the things I'm doing wrong or that I should have done already but haven't yet. My to-do list when I got home was a mile long. I am looking forward to growing & improving this blog/business armed with all my new knowledge. 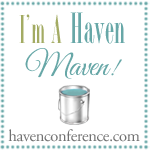 A big thanks to the ladies who put together the Haven Conference; it was a wonderful experience & I am so glad I took the risk to step outside of my comfort zone! !